We are a food truck serving up Authentic Hawaiian food and more. 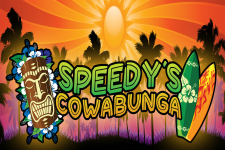 All of our food is made fresh so our customers only have the finest cuisine when they dine at Speedys Cowabunga! We are proud to serve the Springfield area and offer Island food on the mainland, so come explore your tastebuds with us and have some great food that will make you say COWABUNGA DUDE!!!! We can be found in various parts of Springfield throughout the week. The best way to find out where your favorite food truck is located, just log onto our Facebook page daily !! !